Preheat over to 400 degrees-F. In a small bowl, soak dried fruit in the bourbon. In a separate small bowl, mash the banana and set aside. Line two 12-cup muffins pans with paper liners. In a medium mixing bowl, combine flour, baking powder, baking soda, and salt and set aside. In a separate bowl, cream butter and sugar until light and fluffy. Add eggs to the butter and sugar, one at a time until incorporated. Add vanilla and stir. Slowly add flour mixture until smooth. Pour half of the batter into a second mixing bowl. In one bowl, add sour cream and berries, stir until combined. In the other bowl, add the mashed banana and coconut, stir until combined. Spoon muffin batter into lined muffin cups using an ice cream scoop. Bake for 20 minutes or until a toothpick inserted into the center of a muffin comes out clean. Let muffins cool in the pan for five minutes. 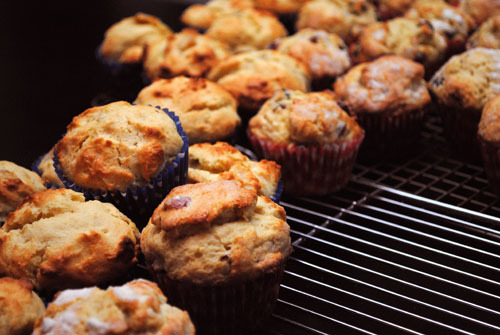 Then transfer muffins to a cooling rack to cool completely. 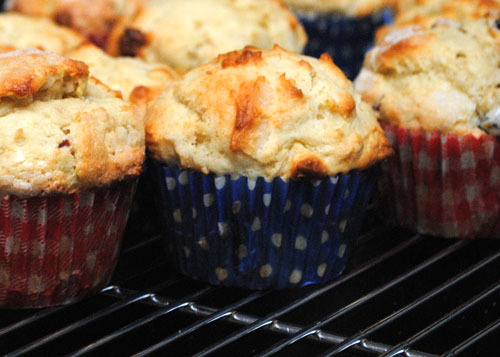 Serve muffins once cooled or store in an airtight container. Recipe will be posted in a few days/weeks. This isn’t a cookbook recipe, so it is a lower priority than the book edits.